Although Christmas is one of the most anticipate holidays of the year, the perspective of having to deal with the aftermath of a snow storm isn’t appealing at all. When requesting snow removal services from our company, most of our clients declared that they are either tired of having to wait around for the local school kids to come or that spending half of day outside shoveling snow isn’t their idea of a great day. Whatever your reasons are, Condray & Young is more than happy to serve you. Don’t let winter take you by surprise, and give us a call. You can book us in advance for a couple of days or the entire duration of winter. 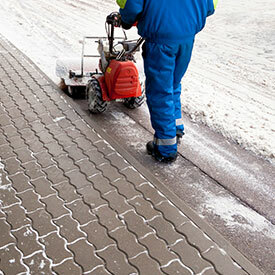 When it comes to snow removal, our company is more than qualified for this type of task. Also, you can request specialized snow removal services. For example, if you want us to shovel the snow just from your driveway or the alley leading to your house, we are more than happy to do it. Our company also employs sound and time-honored de-icing techniques. We only use environmental and hardscape-friendly de-icing substances. To remove the ice from your driveways, or sidewalks, we use a special de-icing agent that is mild to hard surfaces and doesn’t impact the environment. Can’t get the garage door to open in the morning? Then call us! During the cold months of winter, our team is at your service 24 hours per day, seven days per week. Each business owner’s nightmare is to wake up early in the morning and see that his employees or customers cannot reach the company’s headquarters. We’ll be there faster than you can say ‘snow removal,’ to free you from all the snow layer on your property. In terms of commercial snow removal, our services include plowing, shoveling, using de-icing substances for hardscapes, and snow management strategies. You can also book us to keep your company’s parking lot clear of snow for the entire duration of winter. Our high-quality and thoroughly researched snow management techniques will quickly remove the snow from your parking lot and will prevent the formation of ice on hard surfaces. Whether you are looking a company owner who wants to book our premium services for the entire winter or a homeowner who is looking for someone to remove the snow piled in front of his garage, don’t hesitate to call us. As always, before starting the project, you can either call us or use our “Request a Quote” tool on our main page to get an estimate. We can also send someone over to you to make an offer based on your winter budget.